Vacation in Paradise! Groundfloor, Ocean Views, central to everything in Maui! We currently live in California, about an hour north of San Francisco, in the Sonoma-Napa wine country area. We have three sons and three grandsons that keep us busy, and we enjoy traveling to Maui a few times a year, playing golf, or gardening in our spare time. Our first trip to Hawaii was to Oahu in 2001, and we immediately fell in love with the islands. After visiting all the islands, Maui stood out not only as an attraction with the migrating whales, but for its unique features - every part of the island has something different to offer. All the residents are friendly and have been so helpful while we've renovated the condo. Most importantly, though, was the feeling that this was a place to call home, where we plan to retire in a few years. We hope you enjoy our little bit of paradise as much as we do! What appealed to us in purchasing this property is location, location, location! It has mature tropical landscaping, giving the feel of old Hawaii. It is quiet and located at the back of the complex where you don't hear the traffic from Kihei Road, and it is only a minute's walking distance to the beach. Whether you are a morning person who likes to stroll on the beach or a night owl who enjoys the nightlife, island life has something to offer to everyone! Partial ocean view from lanai. 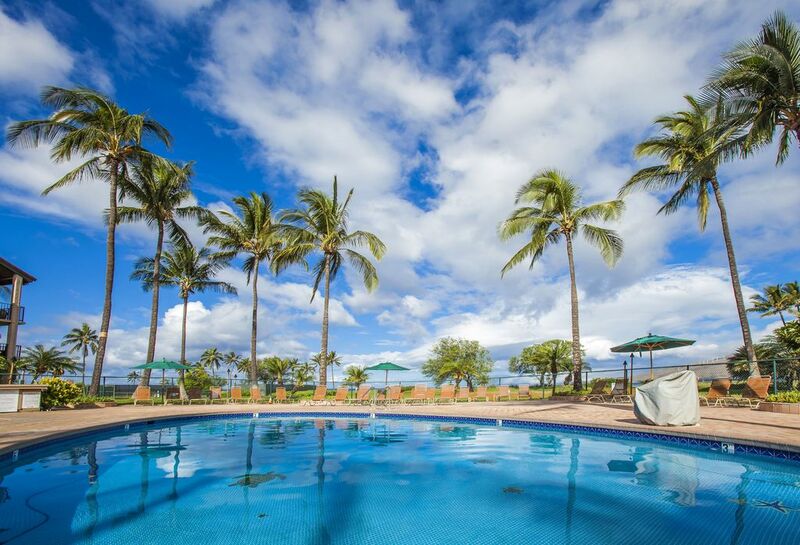 Luana Kai is a large resort complex on Maui's southwest shore, on the sunniest and driest part of the island, centrally located to shops, activities, restaurants and miles of walkable beaches. Spacious with additional 112 sq. ft. lanai, adding to the feeling of openness and outdoor dining. New 48" high def TV with Netflix streaming. Full size and very quiet. Dishwasher soap provided. Garden views of putting green and pool with partial view of large park area and ocean. Lots of room for kids to play! tennis courts are located at back of complex with ocean views. Tennis rackets available inside condo. numerous chaise lounges for reading, sunbathing, and socializing around the outdoor pool and BBQs. Pool opens at 8:00 AM and closes at 10:00 PM. Quiet hours at the complex are 10:00 PM to 8:00 AM. popular with guests, hot tub has restrictions for children - must be at least 50 inches tall (4 ft. 2 inches) to use. So glad you enjoyed the condo and everything was there for you to enjoy! Also hope you left Maui with many good vacation memories! The owner has created a beautiful environment in this condo. It was the best vacation rental we've ever experienced. I am so glad you had such a wonderful trip! And thank you for the compliments about the condo too! Hope to see you again - happy holidays! Loved Maui! The condo was great, very clean, everything I needed. Everyone was so friendly, and I loved taking day trips to all the sights or just hanging out reading a book. Weather was fantastic! Ho'okipa was my favorite beach and loved watching the turtles! Thank you! Glad you enjoyed your stay! Happy holidays! Katie is an amazing host. She has thought of everything and has more there for you use than any rental we've been at. That is so helpful!! The only thing I would recommend is to rent beach chairs. Chairs are provided but they are more like camp chairs and not super comfortable for the beach. We rented from Aunty Snorkels and Scott there is super helpful as well. We enjoyed Maui very much. Thank you for being my guest! Good idea about the beach chairs - first I’ll need to find a place to store them! So glad you enjoyed Maui. Great condo, great amenities, great location! Had a wonderful time in Kehei, condo was super clean and had everything we needed! Katie was very responsive and friendly. Thank you for staying in our condo and happy that you enjoyed Kihei and all of Maui! Wonderful venue witht pool, spa, sauna, putting green, tennis, and shuffle board, on the beach. All the comforts of home include a kitchen with all the amenities, lanai with partial ocean view, king size bed, 2 TVs, WiFi, beach chairs, beach towels, tennis rackets, boogie boards, and a washer and dryer for those on an extended stay. Will definitely stay here again. Thank you Linda for being my guest! I'm so glad you enjoyed the condo, and that the weather was good for your vacation. Look forward to having you again! There is always something to do in Maui! Snorkeling, swimming, surfing, paddleboarding kayaking, windsurfing and during the months December through March, incredible whale watching! Visit the Humpback Whale Sanctuary to learn about this annual migration, and the Aquarium in the Maalaea Harbor Village where you can sign up for snorkeling or whale watching trips or take a sunset dinner cruise. Great restaurants everywhere. The Tropical Plantation and Sugar Museum both offer tours and golf courses abound over the island. Ziplining, bike riding in Haleakala National Park, and driving to Hana all provide fantastic views of the island and what it has to offer.